Back in August, the crew of the International Space Station (ISS) was surprised to learn that a leak was responsible for a slight loss in air pressure aboard the station. After investigating, they learned that the cause was a small hole in the Russian Soyuz spacecraft that had docked with the ISS. While the hole was promptly sealed, the cause of it has remained a mystery ever since. To determine a possible cause, and inspect the external hole on the spacecraft, the crew of Expedition 57 conducted an “unprecedented spacewalk” on Dec. 11th. After collecting samples from the outside of the craft, flight engineers Oleg Kononenko and Sergey Prokopyev concluded that the hole had been drilled from inside the capsule, a finding which raises even more questions. The Soyuz MS-10 spacecraft carrying crew to the ISS was aborted shortly after launch on Thursday, Oct. 11th when its booster failed. The spacecraft executed an emergency ballistic landing with a sharp angle of descent. Both crew members on board—American astronaut Nick Hague and Russian cosmonaut Alexey Ovchinin—exited the capsule safely and are in good condition. In Spring of 2017, NASA revealed their plans for what the massive Space Launch System (SLS) rocket would be used for: to build the Deep Space Gateway, a space station in cis-lunar orbit that’ll serve as a stepping stone to the exploration of the Solar System. Until today, it was assumed that this would be a NASA project, with the agency constructing the station over the course of several launches of the SLS from 2021 through 2026, delivering the 4 major modules. The details were hazy, though, with the various components in development with various contractors. Today, however, NASA and the Russian Space Agency Roscosmos announced that they’ll be building the Deep Space Gateway together. They signed an agreement in Australia at the 68th International Astronautical Congress in Adelaide, Australia, and announced the news to the world. What will Russia be contributing? According to TASS, Russian officials said that they’d be providing one to three modules for the station, as well as the docking mechanism that spacecraft would use when approaching the station. Russia also offered to carry some of the station parts on their new super heavy lift rocket. They didn’t specify the rocket, but that sounds like the Angara rocket which is in development, and is expected to make its first flights over the next few years. 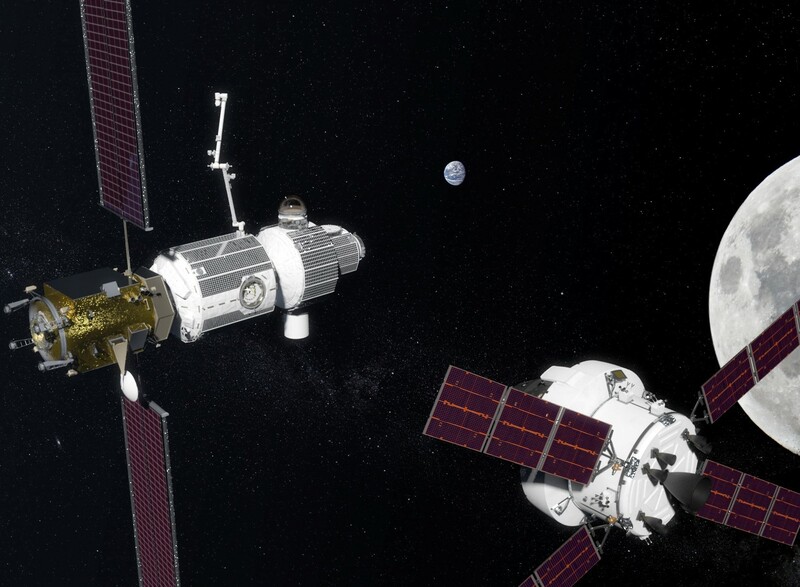 The Deep Space Gateway will serve as the primary destination for NASA’s human space exploration efforts, once the SLS and Orion Crew Module are completed. The first launch of SLS will carry an unmanned Orion capsule on a trans-lunar flight in 2018. Then SLS will be used to blast the Europa Clipper off to the Jovian system. Their original strategy was to launch some time between 2021 and 2023 carrying the Solar Power Electric Bus module to the station, followed by the Habitation Module in 2024, the Logistics Module in 2025 and finally the Airlock Module in 2026. At this point, NASA has solicited proposals from various aerospace contractors for the development of the Power Module, and Habitation System, and they didn’t indicate that Russia’s involvement would have any impact on the construction of these modules. With the Russians announcing their involvement, we don’t really know how this’ll impact the structure of the station or its configuration of modules. This might also be an incentive for other space agencies (like the newly announced Australian Space Agency) to come on board. Of course, the Russians were involved in the construction of the International Space Station. 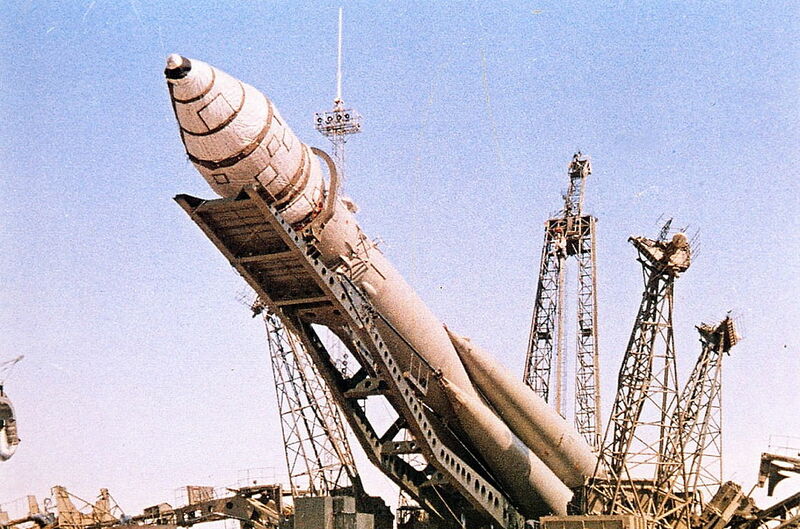 They provided the Zarya module for propulsion and navigational guidence, then the Zvezda for living quarters, and the Pirs, Poisk and Rassvet docking modules. They’ve also provided half the support of the station, including astronauts, and provide the only way to get humans up to the station, on their Soyuz rockets. Until recently, Russia had been threatening to pull their support of the International Space Station, before it was ready for retirement. But earlier this year, they agreed to support ISS until 2024, and even to 2028 if necessary. They’ve also been continuing work on their Multi-Purpose Laboratory Module (MLM), which was originally planned for launch in 2007, and is now expected to be attached to the station some time in 2018. Before announcing their involvement with the Deep Space Gateway, Russia had said that they’d probably be investing in the development of their own orbital space station once the ISS mission was over. They’re also apparently working on a robotic lunar orbiter and lander mission. This isn’t the only announcement involving the Deep Space Gateway. It might also get a solar sail. Engineers from the Canadian Space Agency proposed attaching a small solar sail to the Gateway, which could serve in re-orienting the space station without needing propellant. It would have a surface area of about 50-meters, and would save hundreds of kilograms of hydrozine fuel which would normally be used over the lifespan of the Deep Space Gateway. Check out Anatoly Zak’s excellent reporting on this development for the Planetary Society. Barely a week and a half after the thrilling conclusion to the record breaking space endurance mission by NASA astronaut Peggy Whitson, a new Russian-American trio blasted off for the International Space Station (ISS) on a Russian Soyuz capsule and boarded safely early this morning Wednesday, Sept. 13, after arriving as planned on a fast track orbital trajectory. NASA astronauts Mark Vande Hei, Joe Acaba and Alexander Misurkin of Roscosmos launched aboard the Soyuz MS-06 spacecraft from the Baikonur Cosmodrome in Kazakhstan overnight at 5:17 p.m. Tuesday, Sept. 12, 2017, (2127 GMT), or 3:17 a.m. Baikonur time Wednesday, Sept. 13, on the Expedition 53 mission. Following the flawless launch and achieving orbit the three man crew executed a perfect four orbit, six hour rendezvous and arrived at the orbiting laboratory complex at 10:55 p.m. EDT Tuesday, Sept. 12, (or Wednesday, Sept. 13, Kazakh time) where they will carry out a jam packed schedule of scientific research in a wide array of fields. The entire launch sequence aboard the Soyuz rocket performed flawlessly and delivered the Soyuz capsule to its targeted preliminary orbit eight minutes and 45 seconds after liftoff followed by the opening of the vehicles pair of life giving solar arrays and communications antennas. The whole event from launch to docking was broadcast live on NASA TV. Soyuz reached the ISS after a rapid series of orbit raising maneuvers over four orbits and six hours to successfully complete all the rendezvous and docking procedures to attach to the station at the Russian Poisk module. “Contact! We have mechanical contact,” radioed Misurkin. After conducting leak and safety checks the new trio opened the hatches between the Soyuz spacecraft and station at 1:08 a.m. EDT this morning, Sept. 13 and floated into the million pound orbiting outpost. The arrival of Vande Hei, Acaba and Misurkin restores the station’s multinational habitation to a full complement of six astronaut and cosmonaut crewmembers. They join Expedition 53 Commander Randy Bresnik of NASA and Flight Engineers Sergey Ryazanskiy of Roscosmos and Paolo Nespoli of ESA (European Space Agency). The station had been temporarily reduced to a staff of three for 10 days following the departure of the Expedition 52 crew including record setting Whitson, NASA astronaut Jack Fischer and veteran cosmonaut Fyodor Yurchikhin of Roscosmos. This is the rookie flight for Vande Hei, the second for Misurkin and the third for Acaba. They will remain aboard the station for a planned five month long ISS expedition continuing into early 2018. Vande Hei was selected as an astronaut in 2009. Misurkin previously flew to the station on the Expedition 35/36 increments in 2013. Acaba was selected as an astronaut in 2004. He flew on space shuttle mission STS 119 and conducted two spacewalks – as well as on the Expedition 31/32 increments in 2012 and has logged a total of 138 days in space. Originally the Soyuz MS-06 was only to fly with a two person crew – Vande Hei and Misurkin after the Russians decided to reduce their cosmonaut crew from three to two to save money. Acaba was added to the crew only in March of this year when NASA and Roscosmos brokered an agreement to fill the empty seat with a NASA astronaut, under an arrangement worked out for 5 astronauts seats on Soyuz through a procurement by Boeing, as compensation for an unrelated matter. The Russian cosmonaut crew cutback enabled Whitson’s mission extension by three months and also proved to be a boon for NASA and science research. It enabled the US/partner USOS crew complement to be enlarged from three to four full time astronauts much earlier than expected. This allowed NASA to about double the weekly time devoted to research aboard station – a feat not expected to happen until America’s commercial crew vehicles, namely Boeing Starliner and SpaceX Crew Dragon – finally begin inaugural launches next year from the Kennedy Space Center in mid-2018. With Acaba and Vande Hei now on orbit joining Bresnik and Nespoli, the USOS crew stands at four and will continue. The six crewmembers will carry out research supporting more than 250 experiments in astrophysics, biology, biotechnology, physical science and Earth science. “During Expedition 53, researchers will study the cosmic ray particles, demonstrate the benefits of manufacturing fiber optic filaments in microgravity, investigate targeted therapies to improve muscle atrophy and explore the abilities of a new drug to accelerate bone repair,” says NASA. Among the key investigations involves research on cosmic ray particles reaching Earth using ISS-CREAM, examining effects on the musculoskeletal system and exploring targeted therapies for slowing or reversal of muscle atrophy with Rodent Research 6 (RR-6), demonstrating the benefits of manufacturing fiber optic filaments in a microgravity environment with the Optical Fiber Production in Microgravity (Made in Space Fiber Optics) hardware, and working on drugs and materials for accelerating bone repair with the Synthetic Bone experiment to develop more effective treatments for patients with osteoporosis. Bresnik, Ryazanskiy and Nespoli are scheduled to remain aboard the station until December. Whereas Vande Hei, Acaba and Misurkin are slated to return in February 2018. Meanwhile one of the first tasks of the new trio will be to assist with the departure of the SpaceX Dragon CRS-12 spacecraft upcoming this Sunday, Sept 17. Dragon will be detached from the Harmony module using the stations Canadian-built robotic arm on Sunday and released for a splashdown and retrieval in the Pacific Ocean Sunday morning. It is carrying some hardware items as well as scores of science samples. NASA TV will cover the release activities beginning Sunday at 4:30 a.m. EDT. KENNEDY SPACE CENTER, FL – A new Russian/American duo has arrived at the International Space Station this morning, April 20, after a six-hour flight following their successful launch aboard a Russian Soyuz capsule on a fast track trajectory to the orbiting outpost. The two person international crew comprising NASA astronaut Jack Fischer and cosmonaut Fyodor Yurchikhin of the Russian space agency Roscosmos launched aboard a Russian Soyuz MS-04 spacecraft from the Baikonur Cosmodrome in Kazakhstan at 3:13 a.m. (1:13 p.m. Baikonur time). 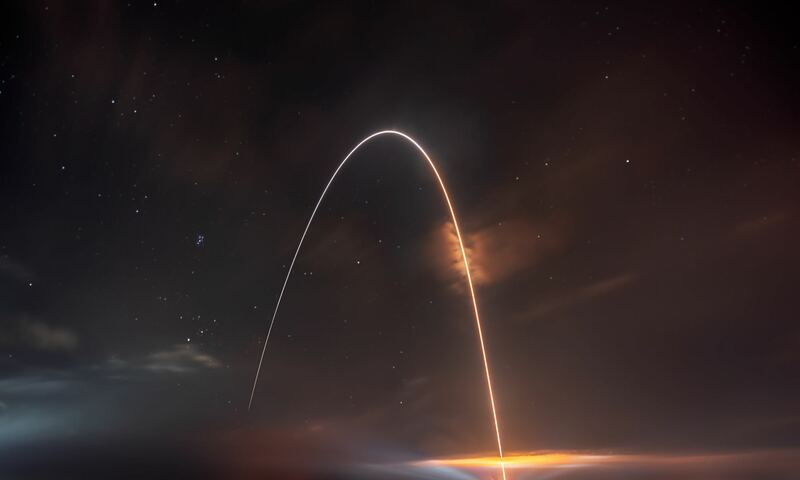 After orbiting the Earth just four times on a planned accelerated trajectory they reached the station six hours later and safely docked at the station at 9:18 a.m. EDT. “We have contact and capture confirmed at the space station at 9:18 am EDT,” said the NASA Houston mission control commentator. The station and Soyuz vehicles were flying some 250 mi (400 km) over the northern Atlantic at the time of docking. The dynamic duo of Yurchikhin and Fischer join three Expedition 51 crew members already onboard – Expedition 51 Commander Peggy Whitson of NASA and Flight Engineers Oleg Novitskiy of Roscosmos and Thomas Pesquet of ESA (European Space Agency). Thus the overall station crew complement of astronauts and cosmonauts increases to five – from the US, Russia and France – representing their respective space agencies and countries. Jack Fisher is a rookie space flyer whereas Yurchikhin is an accomplished veteran on this his 5th mission to orbit. Prior to docking the crew accomplished an approximately 10 min flyaround inside the Soyuz shortly before sunrise and beautyfully backdropped by earth towards the end at a distance of roughly several hundred meters away. All Soyuz systems performed as planned for what was an entirely automated rendezvous and docking using the Russian KURS docking system. The crew could have intervened if needed. The new pair of Expedition 51 crew members will spend about four and a half months aboard the station during their increment. They will be very busy conducting approximately 250 science investigations in fields such as biology, Earth science, human research, physical sciences and technology development. And there will be no time to rest! Because this week’s just launched unpiloted ‘SS John Glenn’ Cygnus resupply ship is eagerly awaiting its chance to join the station and deliver nearly 4 tons of science experiment, gear and crew provisions to stock the station and further enhance its research output. Orbital ATK’s seventh Cygnus cargo delivery flight to the station – dubbed OA-7 or CRS-7 – launched at 11:11 a.m. EDT Tuesday, April 18 atop a United Launch Alliance Atlas V rocket from Space Launch Complex 41 on Cape Canaveral Air Force Station in Florida. The SS John Glenn is expected to arrive at the station early Saturday morning on April 22. Expedition 51 astronauts Thomas Pesquet of ESA and Peggy Whitson of NASA will use the space station’s Canadian-built robotic arm to grapple Cygnus, about 6:05 a.m. Saturday. “Investigations arriving will include an antibody investigation that could increase the effectiveness of chemotherapy drugs for cancer treatment and an advanced plant habitat for studying plant physiology and growth of fresh food in space,” says NASA. Roscosmos has certainly come a long way in the past few decades. After facing an uncertain future in the 1990s, the federal space agency has rebounded to become a major player in space and a crucial partner in the International Space Station. And in the coming years, Roscosmos hopes to expand its reach further, with missions planned to the Moon and even Mars. Understandably, Roscosmos is hoping to jump start its space exploration program again and recapture the momentum it enjoyed during the Soviet Era. In addition to Sputnik and sending the first man and woman into space (as part of the Vostok program), the Soviet space program also produced a reusable spacecraft by the 1980s that was similar to the Space Shuttle (known as the Buran program). Unfortunately, with budget cuts during this decade and the fall of the Soviet Union in 1991, several changes had to be made. For one, Roscosmos needed to turn to commercial satellite launches and space tourism in order to make up the difference in its funding. In addition, some observers have cited how Russia’s financial commitment to the ISS has had a detrimental effect on other programs. It is little wonder then why Russian wants to embark on some serious missions in the coming decades, ones which will reestablish it as a leader in space exploration. Intrinsic to this is a proposed crewed mission to the Moon, which is scheduled to take place in 2031. Roscosmos has also been developing the next-generation spacecraft that will replace the Soyuz-TMA, which has been the workhorse of the space program since the Soviet era. Known as the the Federatsiya (Federation) capsule, this vehicle is scheduled to make its first crewed flight to space sometime in 2023 from the Vostochny cosmodrome in the Russian far east. As you can see from the images, it bears a striking resemblance to the Orion capsule. Unveiled at the 12th International Aviation and Space Salon in Moscow (MAKS-2015), this capsule will carry the first Russian cosmonauts to the Moon. All they need now is fresh blood to make the journey. Hence why they are conducting their first recruitment drive in five years, which is the second drive to be is open to all people – not just military pilots, but also those working in the space industry. This time around, Roscosmos is looking for 6 to 8 new recruits who will train in how to fly the next-generation spaceships and make Russia’s long-awaited lunar landing. As Sergei Kiralyov (Roscosmos’ Executive Director of Manned Programs) was quoted by RIA Novosti as saying, “There will be no discrimination based on skin colour or gender.” The criteria for these applicants include an age limit of 35, a height of between 1 m 50 cm – 1 m 90 cm (4’11” and 6’2″), and a weight of no more than 90 kilograms (~198 pounds). The criteria also stress physical fitness, and claim that applicants must be able to cross-country ski for 5 km (~3 mi). They must also pass a series of psychological and physical tests (which include gynaecological examinations for women). In terms of skills, Roscosmos is seeking individuals who have an engineering degree, pilot training, experience in the aviation industry, and IT skills. Knowledge of a foreign language is also a plus (other than Russian, of course!). “Recruitment of cosmonauts will take place starting from today, March 14, will take place before the end of the year. The results would be summed up in the end of December,” said Roscosmos’ First Deputy Director General Alexander Ivanov. Roscosmos also stressed that all those who are interested must apply by post or in person at the Star City astronaut training center outside Moscow (with three passport-sized photos included). So if you speak Russian, are interesting in becoming part of the next-generation of cosmonauts, meet the requirements, or just want to go to the Moon, you might want to consider throwing your hat into the ring! Down the road, Roscosmos also has plans to conduct crewed missions to Mars between 2040 and 2060. These are expected to take place only after missions to the Moon are complete, which may include the creation of a lunar outpost. Planning for the ISS began in the 1980s and was based in part on the successes of Russia’s Mir space station, NASA’s Skylab, and the Space Shuttle Program. This station, it was hoped, would allow for the future utilization of low-Earth Orbit and its resources, and serve as an intermediate base for renewed exploration efforts to the Moon, mission to Mars, and beyond. Hygiene is maintained thanks to water jets and soap dispensed from tubes, as well as wet wipes, rinseless shampoo, and edible toothpaste. Sanitation is provided by two space toilets – both of Russian design – aboard the Zvezda and Tranquility Modules. Similar to what was available aboard the Space Shuttle, astronauts fasten themselves to the toilet seat and the removal of waste is accomplished with a vacuum suction hole. As we celebrate the Christmas tidings of 2016 here on Earth, a lucky multinational crew of astronauts and cosmonauts celebrate the festive season floating in Zero-G while living and working together in space aboard the Earth orbiting International Space Station (ISS) complex – peacefully cooperating to benefit all humanity. Today, Dec. 25, 2016, the six person Expedition 50 crew of five men and one woman marked the joyous holiday of Christ’s birth by gathering for a festive meal in space – as billions of Earthlings celebrated this Christmas season of giving, remembrance and peace to all here on our home planet. This year is an especially noteworthy Space Christmas because it counts as Expedition 50. This is the 50th crew to reside on board since the space station began operating with permanent occupancy by rotating crews all the way back to 1998. The Expedition 50 crew currently comprises of people from three nations supporting the ISS – namely the US, Russia and France; Commander Shane Kimbrough from NASA and flight engineers Andrey Borisenko (Roscosmos), Sergey Ryzhikov (Roscosmos), Thomas Pesquet (ESA), Peggy Whitson (NASA), and Oleg Novitskiy (Roscosmos). “Hello from the Expedition 50 Crew! We’d like to share what Christmas means to us,” said Expedition 50 Commander Shane Kimbrough. Kimbrough arrived on the complex in October, followed a month later by Whitson and Pesquet in November. They were all launched aboard Russian Soyuz capsules from the Baikonur Cosmodrome in Kazakhstan. 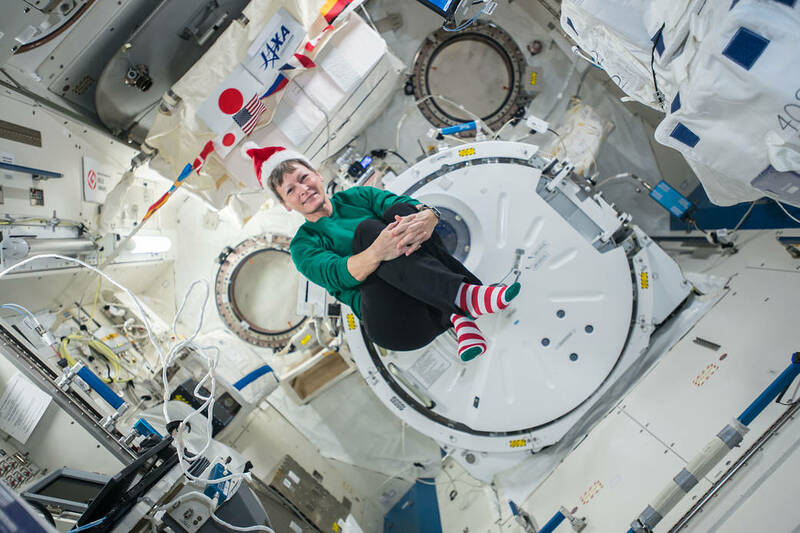 Aboard the International Space Station, Expedition 50 Flight Engineer Peggy Whitson of NASA sent holiday greetings and festive imagery from the cupola on Dec. 18, 2016. Credit: NASA. And Peggy Whitson especially has a lot to celebrate in space! Because not only is Whitson currently enjoying her third long-duration flight aboard the station – as an Expedition 50 flight engineer. Soon she will become the first woman to command the station twice ! That momentous event happens when she assumes the role of Space Station Commander early in 2017 during the start of Expedition 51. “In addition to family, there is another very important aspect to being on the ISS,” said Whitson. The crew is enjoying a light weekend of work and a day off tomorrow, Dec. 26. After that they begin preparing for a pair of spacewalks in the new year by Kimbrough and Whitson – scheduled for Jan. 6 and 13. The crew is checking the spacesuits by testing the water among other activities. The goal of the excursions is to “complete the replacement of old nickel-hydrogen batteries with new lithium-ion batteries on the station’s truss structure,” says NASA. Among other activities, the crew is also unloading 4.5 tons of internal and external cargo, gear and fresh food – including six lithium-ion batteries – from Japan’s sixth H-II Transfer Vehicle (HTV-6), which recently arrived at the ISS on Dec 13. The next regular US cargo delivery is likely to be in March 2017, when an unmanned Orbital ATK Cygnus cargo freighter is slated to launch on a ULA Atlas V from Cape Canaveral. A Cygnus was also launched on a ULA Atlas V in March 2016. SpaceX also hopes to resume Dragon cargo launches sometime in the new year after they resolve the issues that led to the destruction of a SpaceX Falcon 9 on Sept. 1 during fueling operations at pad 40 on the Cape. Meanwhile Roscosmos continues to investigate the causes of the failed launch of the unmanned Russian Progress 65 resupply ship on Dec. 1 due to a 3rd stage anomaly.